Maryland is known for its incredible seafood. But when you’re in the mood to explore a little bit outside of your comfort zone, perhaps away from the crab by the dock, you can’t do much better than an authentic French food experience. Find 10 of our favorite spots below. Restaurant 213 in Fruitland, Maryland, has tons of accolades and favorable reviews, including from Go! Magazine, San Antonio Express-News, Wine Enthusiast Magazine, and more. Dinner at 213 is served Tuesday-Saturday. 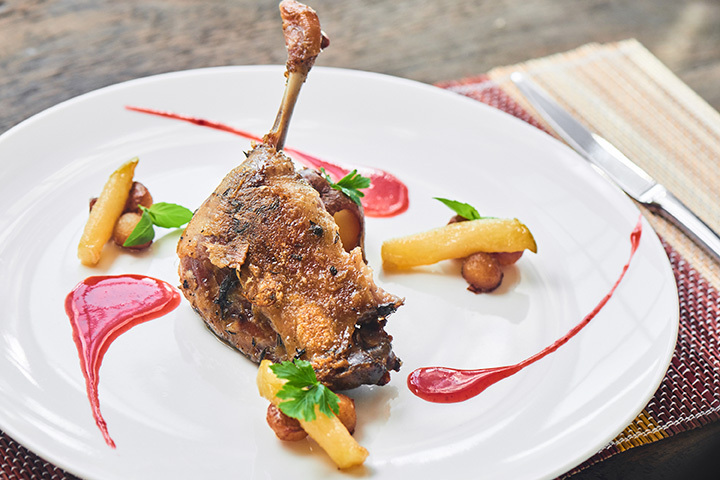 The menu is heavily French and fine dining inspired, with dishes like escargot and more. Bistro Poplar in Cambridge, Maryland, offers modern bistro cuisine and “stays true to classic French cuisine while blending Mediterranean and Asian flavors for a uniquely American result.” Their seasonal menu is constantly changing to bring out the best flavors of the season. Stop in Sunday to try a variety of small-plate tapas. Crepes A-Go-Go brings the casual creperies of Paris to Gaithersburg, Maryland. The crepes are made to order and come in sweet or savory varieties. They also have gelato if your sweet tooth isn’t satiated by the crepe. Tersiguels in Ellicott City, Maryland, offers French country cooking every night of the week and for Sunday brunch. The restaurant is happy to offer French clubs and students a special menu to help them practice their French and learn from the staff. Book your table on their website or call ahead. Café Bretton in Severna Park, Maryland, is known for their wine, organic foods, and desserts. All meals are produced with ingredients grown in their on-site garden. The restaurant itself has a charming French château feel. If you can only enjoy one dish, try the grilled lamb lollipop. Award-winning Chef Jean-Louis has offered authentic French cuisine for the last 31 years to Annapolis, Maryland, diners. They are open for lunch and dinner Monday—Sunday and offer a breakfast menu on the weekends. Check their website for the specials before coming in. Le Viex Logis brings authentic French flair to Bethesda, Maryland. One 2015 review in the Washington Post said that Le Vieux Logis has “the best meal in Maryland.” The meal in question? Duck and petit filet, both rave-worthy. If TripAdvisor reviews are any indication, then La Ferme is simply wonderful. The dinner menu is chock full of French favorites prepared well. They offer lunch on Saturday, but it’s reserved for private events of at least 20 people. Brunch is served most Sundays from 11:30 a.m. to 2 p.m.
Mosaic Cuisine offers French cuisine with a modern twist. According to their website, “throughout the menu, look for various cuisines from around the world, such as waffle French toast from Belgium, tomato and pesto soup from Palermo, Italy, artichoke and spinach dip from USA, and chocolate financier direct from heaven.” Though Mosaic offers a mosaic of options, the main attraction here is the French food. The beef bourgignion is particularly scrumptious.